This is the Dokken dead fowl pheasant. It's just like all the other Dokken's in that it's designed to feel like a dead bird. The difference with the pheasant is that it comes with a tail. A lot of dogs, if you don't train with this, the first time they see a pheasant they are just not used to having that additional giant feather there. So it kinda adds a little bit of realism to what you are doing. Dead fowls are just like all the rest of them. It's got the soft body. It's designed to teach the dog to go for the center of the bird. It's got a hard head and it's got hard feet, so it keeps dogs from grabbing there. And then you've also got the moving head. If you've got a dog that's a shaker it's going to give them a correction. Just like all the other Dokken dead fowls the rope goes through the entire body to the head. Great training tool. I use them all the time. The foam body is designed where you can add scent to it so that it has a little more sense of realism. The biggest downside to the dead fowl trainers is that a lot of dogs, once they start using them, they do not want to go back to dummies. So once you are kind of in, you are in with dead fowl trainers. I use dead fowl trainers and birds as much as possible because it just adds that realism to your training that will help your dog once you move into the field. "What I don't like about the product is so durable that it has outlasted my dogs hunting years, and is now taking up space in my hunting closet waiting for another hunting dog to train with." I like the size and durability of the product. My Female Lab was rough on the training aid. She would get it in her mouth and shake it vigorously like a real pheasant that is not quite dead. The training aid has stood up to the abuse of both my dogs. Because the pheasant floats, I used the same training aid to train my dogs for ducks! The best feature is the string that can be used for throwing the bird long distances. What I don't like about the product is so durable that it has outlasted my dogs hunting years, and is now taking up space in my hunting closet waiting for another hunting dog to train with. "Make sure to buy the throwing ball, as you will get more distance from your throws when working without a helper." I only hunt pheasants, so I decided in training to use only the dead fowl pheasants. I ended up with 20, and they have held together very well over the last 3 years. My dog loves them. Make sure to buy the throwing ball, as you will get more distance from your throws when working without a helper. "One of the best all-around hunting buys I have ever made in my 35 years of bird hunting." One of the best all-around hunting buys I have ever made in my 35 years of bird hunting. My shorthair could play "Retrieve the dead pheasant" all day long if I had the energy. Using the dummy has helped with developing patience, discipline, attentiveness, and bonding. You have never seen a dog get so excited and happy until you walk outside with the dummy in your hand. It is hilarious. Get one, you won't be disappointed. "She figured out very quickly that the only manageable way to carry this dummy is over the body from the side, just how she's suppose to." English Springer Spaniel. Hunts. Family pet. Competes. I've used this all summer and have been extremely happy with it. To explain my last point, my pup always insisted picking up her regular canvas dummies (with or without wings attached) by the absolute smallest point of it. Seemed to make it more challenging for her or something. This dummy though, she figured out very quickly that the only manageable way to carry this dummy is over the body from the side, just how she's suppose to. In addition to this I also have the ruffed grouse (we hunt them in Northern, MN) and quail (it was her starter when she was too small to carry the others). All of them have held up great. "Worked great to finish up the pup before her first wild bird season." Worked great to finish up the pup before her first wild bird season. She's carrying the wild pheasants perfect! "After working with this for a while, he knows just what to do with the real ones." This is the second Dead Fowl Dummy I've bought. The first being the dove when my Brittany was just a pup. He had a hard time with retrieving pheasants because of their size. After working with this for a while, he knows just what to do with the real ones. I can't go outside without him wanting me to throw this thing either! "My lab loves her pheasant dummy!" Abby, my lab, loves her pheasent dummy! Works great! GSP pup is having fun dragging it back to me. He is 12 weeks old. Very durable. "Lasts for years, thousands of throws and retrieves." Lasts for years, thousands of throws and retrieves. "If you have never used a Dokken dummy, do yourself a favor and buy several!" If you have never used a Dokken dummy, do yourself a favor and buy several! "One session with this, and I feel I will get my birds to me undamaged." Love the weight. Gus is 13 months old. One session with this, and I feel I will get my birds to me undamaged. Forces her to hold it correctly. She loves it!! "Dokken has the best trainers, and Gun Dog Supply has them at a great price. " What's to say. Dokken has the best trainers, and Gun Dog Supply has them at a great price. Thanks! The best training tool ever used. My GSP LOVES this! "Work good for either field or water retrieves." Work good for either field or water retrieves. "Best buy I have made for her yet." My 7 month old Lab absolutely loves this. Best buy I have made for her yet. "Great dummy and teaches the dog exactly were to pick up the bird"
German short-haired pointer. Hunts. Family pet. Works great. The soft body teaches my spaniel where to hold the bird while the hard feet and head keeps her from shaking the bird while retrieving it. "Haven't had opportunity to use it yet, but think it's well made and will work well with training my lab." Haven't had opportunity to use it yet, but think it's well made and will work well with training my lab. "Our pup loves this dummy!!! " Our pup loves this dummy!!! This is our third Dokken. We have a mallard for water work, Quail for upland and this pheasant for field. I would recommend the ball attachment and pheasant scent. I was concerned with the tail. It's thin, flexible and durable. Adds realism to training. Awesome. My dog loves it, and acts like it's the real thing! My dog would not touch it until I injected it with the pheasant scent. Puppy coming soon. My daughter amd son-in-law are getting back into pheasent hunting and wanted this for training. Excellent for illustrating size to a room full of judges at the AKC/DJAA Sporting Dog Institute that need to understand how critical correct under jaw and muzzle length are in my breed. Works good. Helping me train a young hunting dog. Great training tool. Very realistic and well made. Very realistic in size and weight. Inject with scent and it makes a killer training combo. Great product!!!! Highly recommend it for training your dog to retrieve. 9 month old loves retrieving this. Excellent training tool. No complaints! Good product and excellent service! Training 1 yr old Vizsla, this thing is indestructible. My Spinone puppy loves it. "Put a little pheasant stink on it, and it's a great training tool." Put a little pheasant stink on it, and it's a great training tool. "Helped in training to grab the body and hold it till I ask for it. Great product!!!" My pheasant trainer is three years old. It is used really hard about 3 months a year, both on land and in the water. I'm hoping for a new one for Christmas. It really helped in training Rosey to grab the body and hold it till I ask for it. Great product!!! "Great service and really fast shipping"
Great service and really fast shipping. "The Dokken Pheasant is a perfect tool to train the dogs how to pick them up and hold them softly." 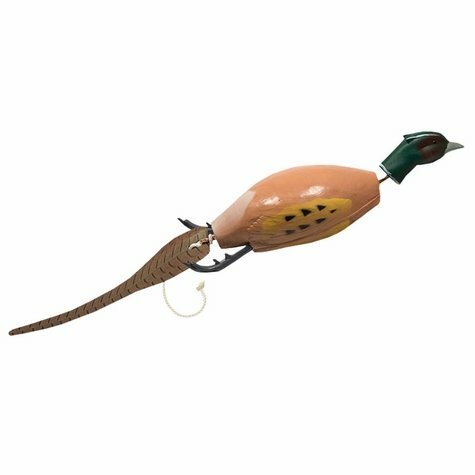 The Dokken Pheasant is a perfect tool to train the dogs how to pick them up and hold them softly. Only criticism is that the throwing knob should be included in all Dokkens sold. Thanks again for being a sponsor for the 2011 Canadian National Toller Specialty. "Trainer has a natural weight and balance. Specialized head and tail force the dog to retrieve by the body. Body allows for the injection of training scent." Trainer has a natural weight and balance. Specialized head and tail force the dog to retrieve by the body. Body allows for the injection of training scent. Also, Steve's price is very competitive with excellent customer service. "I wanted my dogs, especially my English Cockers to have the feel of handling a dummy the size of a rooster pheasant." English Cockers and Springer. Hunts. Family pet. Competes. I wanted my dogs, especially my English Cockers to have the feel of handling a dummy the size of a rooster pheasant. It is very good for that. It holds scent very well for hunt dead practice when I don't have real birds. I removed the tail. I wasn't fond of it. It is too rigid. The wee English Cockers have a tendancy to step on it on the return. "Size & weight are close to actual. I like the movement, it gives the pup a close experience to a down pheasant"
"Sturdy, easy on the mouth, scentable, and throws well!" Sturdy, easy on the mouth, scentable, and throws well! "The weight and size is good for training. I would like to have the tail "feather" a little more flexible and add a couple more "feathers"." The weight and size is good for training. I would like to have the tail "feather" a little more flexible and add a couple more "feathers". Overall I like the dead fowl trainers and use them regularly. Realistic and resiliant. 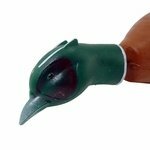 Also purchased a wood duck. Keep up the good work. Your email ads and follow up are great. "I would recommend this to anyone with a old or new dog." It works really well with the scent that you can purchase. I got the pheasant scent and has helped in retrieving, locating when hidden, and also on where and how to grab the birds. I would recommend this to anyone with a old or new dog. It is durable, and I have two pups that work with it. "Best dummies I have ever used. Very realistic and gets my dogs more excited than regular dummies"
These are the best dummies I have ever used. They are very realistic and gets my dogs more excited than regular dummies. These dummies are very durable and float really well. "My pup absolutely loves it and has since it first arrived." My pup absolutely loves it and has since it first arrived. The only issue is it's a little large for my pup, so he bites the head to pack it. I should have purchased the quail trainer to start him out with, then purchased the pheasant as he got older. I used again yesterday and was going after the body, but it is still a little large for him. I would recommend this, as he still goes crazy when I bring it out. "Good, that's why I purchase them." Good, that's why I purchase them. "Both the dog and the owner love this." Both the dog and the owner love this. 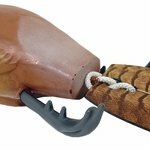 "This product is great for teaching proper retrieving of an upland game bird." This product is great for teaching proper retrieving of an upland game bird. "Being used with injected scent to prepare my dog for NAVHDA testing"
Being used with injected scent to prepare my dog for NAVHDA testing (following track and finding & pointing game). "My dog loves it. It's a very good training device." My dog loves it. It's a very good training device. "My dog loves these. The hard plastic head really has helped stop her from thrashing the bird. I'm definitely a fan of these." My dog loves these. The hard plastic head really has helped stop her from thrashing the bird. I'm definitely a fan of these. "Great tool for my dogs and a great price that beat the local shops in my home town." Cody carries the dummy each time we go out for our evening walks. Gypsie will retrieve the bird to the point Cody takes it from her so he can carry it the rest of the way. Great tool for my dogs and a great price that beat the local shops in my home town. "The quality is spot on like the rest of the dead fowl trainers I've owned." A little on the large side for a pup, but the quality is spot on like the rest of the dead fowl trainers I've owned. "This Dokken is great for a larger breed or a dog who naturally retrieves." This Dokken is great for a larger breed or a dog who naturally retrieves. It is not a good size to start your puppy with since the size may not fit in the mouth. "Dog seems to really enjoy retrieving it and it throws easy." So far, seems like a good training tool. Dog seems to really enjoy retrieving it and it throws easy. Shortly after receiving it, the paint or topcoat started to come off in the tail area. The size and weight of this dummy is a good resemblance of a live bird. The movement in the head and tail help to discourage the dog from shaking the bird on retrieve. Helps for a soft mouth. This dummy would have been a five star if they were to add a ball or handle to the rope to make it easier to throw. "Great training tool, however, if left unattended, my dog was able to chew it up pretty well." Great training tool, however, if left unattended, my dog was able to chew it up pretty well. So far it's holding up well, but the head and tail connection to the body seems weak. Only time will tell if it is. Hopefully I am wrong, but I am reluctant to use exclusively for fetching. I will use the bumpers for the majority of training, and then use the Dokken as hunting season gets near. My German Short Hair does not like the dummy but my Blood Hound does. This dummy has been very effective in teaching him to retrieve, especially when used with the Pheasant scent. FCR & Cocker. Hunts. Competes. "Great product, but I liked working with the bumper with wings already attached"
It is a great product, but I liked the working with the bumper with wings already attached though. "Works well for retrieving training." Works well for retrieving training. "Haven't used it enough to form a solid opinion." "In all fairness I am rating this Dummy as average because my dog has no interest in it." In all fairness I am rating this Dummy as average because my dog has no interest in it. I have injected pheasant scent into it and she will run over to it sniff it and leave it laying there. Now on live birds she is rock steady on point and will retrieve them once shot. I guess I am rating it more on how my dog likes it rather then me so much. Summary: Steve the Dokken \\Pheasant is a perfect tool to train the dogs how to pick them up and hold them softly. Only criticism is that the throwing knob should be included in all Dokkens sold. Thanks again for being a sponsor for the 2011 Canadian National Toller Specialty.